While Goethe's words were actually “see Naples and die,” Rome is undoubtedly the more beautiful city. Thus the chief threat to compleating a full round of her Seven Hills is the range of tempting photographic diversions and exquisite sights that the Imperial City offers. · These hills are surprising close together: several are less than half a kilometre apart. And they rise barely 70 metres above Rome’s Forum (itself at a mere 15 metres above sea level). Walking all the hills is going to be easier than taking in the South Glen Shiel Ridge! · The ‘hills’ are in fact a single plateau into which rivers carved ravines, which then have then become eroded into rounded valleys. The plateau consisted of alluvial deposits from the Tiber, overlain with compacted ash and other materials of volcanic origin (tuffs) from 3-600,000 years ago. The gouged-out relief thus mirrors that of the Cairngorms albeit on a punier scale. · Each hill was the preserve of a tribe: Romulus in legend, and the Ramnes later, occupied the Palatine Hill. Sabines from further north came to occupy the neighbouring Quirinal hill; the Luceres took the Coelian hill. But the situation was dynamic as some tribes became allies, and as newcomers were forced to remain on the cols and lower levels until they had proven themselves trustworthy. · A round of these hills takes in many of the famous sites of central and eastern Rome – with the opportunity to view them from higher up or lower down. This is because [see Grant Heiken, Renato Funiciello, and Donatella de Rita: The Seven Hills of Rome] “the floors of small tributaries were convenient, open sites for markets, theatres such as the Theatre of Marcellus, and larger public structures like the Coliseum and the Pantheon. The plateau’s tuff deposits were also the source of stone used for early city walls and the foundations of the great buildings of Imperial Rome.” The (very) level Circus Maximus nestles between the Aventine and Palatine Hills. · Finally, as with all hill-lists everywhere, there are issues! 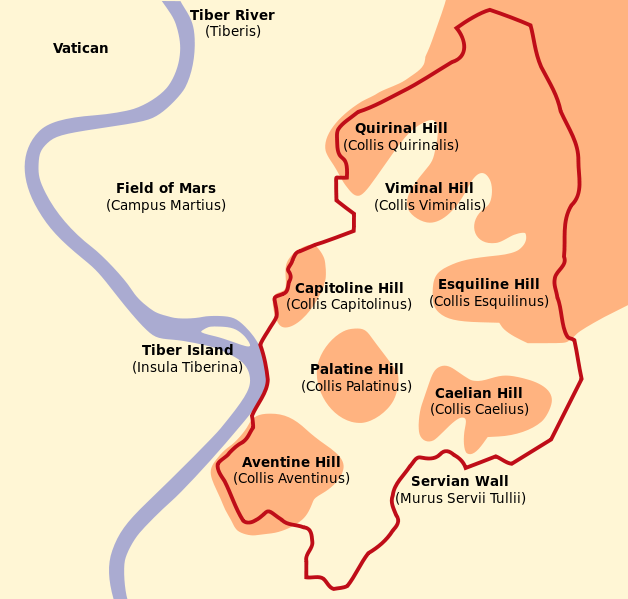 The original list of Seven Hills was created in the late Republican era when Rome was smaller. It thus excludes three higher hills across which Rome eventually expanded: The Pincian to the north, and the Janiculum and Vatican to the West. But not to worry: a resolute party can include these too in a longer traverse and still be home by dinner-time! My round took nearly 4 hours including 12 kilometres, 300 metres of ascent, lunch, and many photos. The hills’ coordinates are presented at the end of this report. If like me you stay near the Spanish Steps, it makes sense to start from the Quirinal Hill and proceed clockwise. This will allow you to flex and extend the latter – and more interesting – half of the route to fill your remaining time. And the Capitoline Hill provides an unparalleled climax for the day, particularly if the sun is setting rose-pink as you arrive there and is drawing out the mellow tones of Rome’s red masonry. 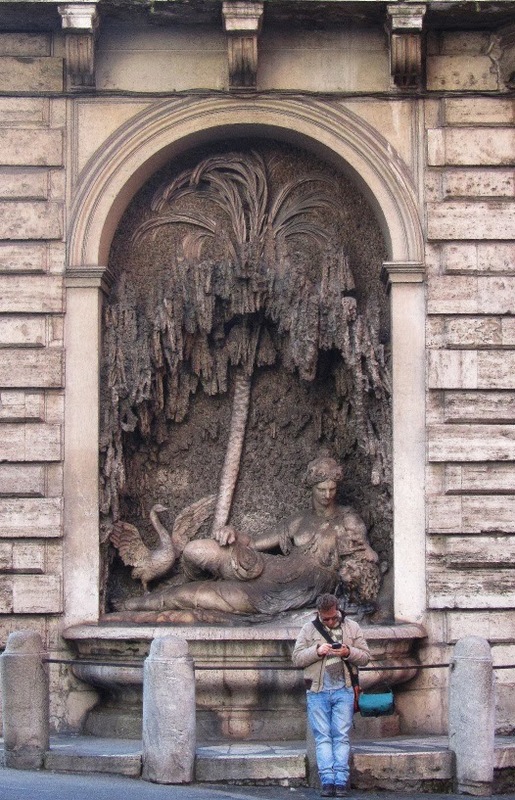 · In the sixteenth century, the airy heights of the Quirinal Hill offered convenient relief from the malarial miasmas from which the Vatican suffered in summer. Hence the Quirinal Palace was founded to house Popes, then Kings, then Presidents of Italy. It is apparently festooned with valuables, but open on selected Sundays only so check your dates. From this starting point, visit the Church of St Andrea al Quirinale opposite, with its works by Bernini, then proceed to the crossroads of The Four Fountains (Quattro Fontane). This is the highest point of the hill and offers a reclining deity at each of its four corners, and Roman-straight views down the four streets between them. 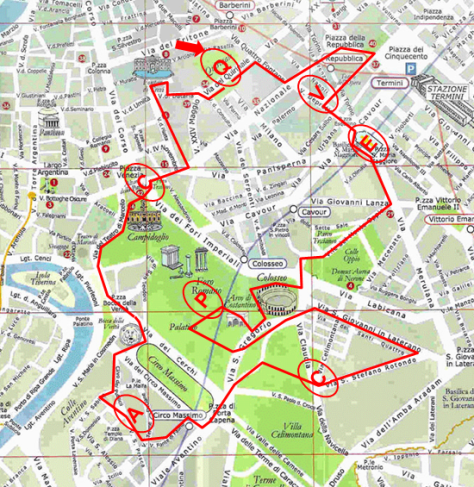 · Now turn SE for the walk of 500 metres to Viminal Hill. 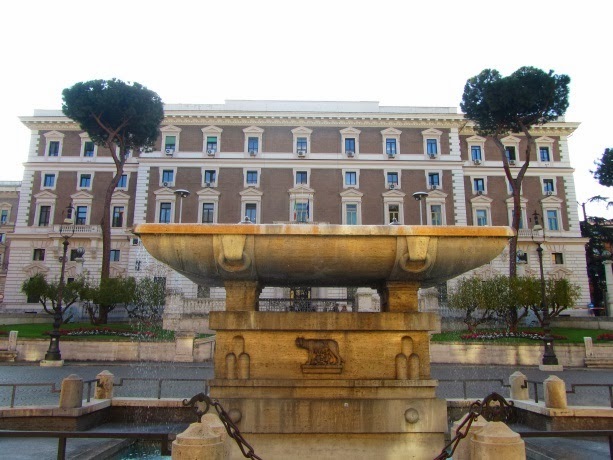 The highest point is near the Piazza del Viminale with its impressive fountain, palace and pines. But you will want to get there via the detour through Piazza della Republica for the view of the Opera or a visit to it, and (yet another) fine fountain. 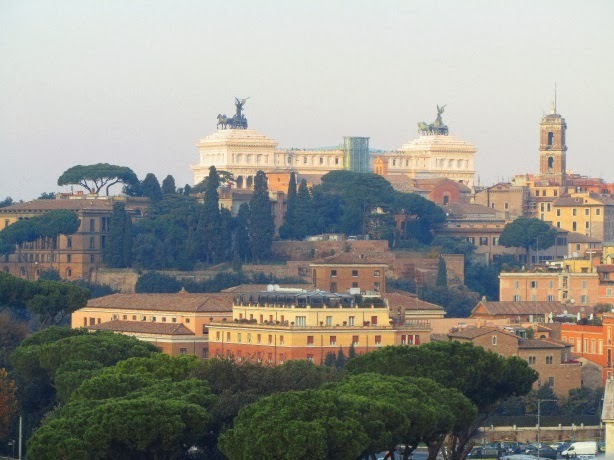 · Another short hop has you on the Esquiline Hill, one of Rome’s largest hills, rising behind the Coliseum. Near its highest point arises the vast Basilica Santa Maria Maggiore, overlooking the Piazza dell’ Esqualino, and with its huge column supporting the Virgin nearby. Heading S to the Coliseum, take a route past or through San Pietro in Vincoli (in chains). Here you can see both Michelangelo’s statue of Moses and the chains with which Saint Peter was bound in Rome’s Mamertine prison! · The sense of excitement now builds as you head SW past (or through) the Coliseum to approach the Palatine Hill. Enter the historic area from the Via di San Gregorio entrance and wander the ruins, taking in the Forum (lower down) if you wish before climbing to the top of the hill near the Stadium and the church of San Bonaventura al Palatino. The hill has been a des-res for millennia and in addition to Romulus and Remus, residents included Cicero, Catullus, Augusts, Caligula, Tiberius and Domitian. 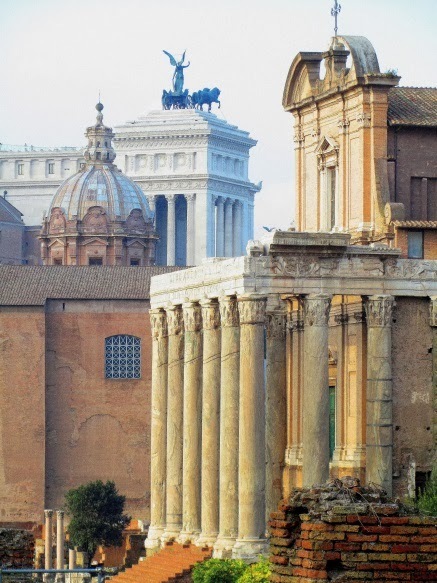 · Now descend E, round the Coliseum and head towards the Caelian Hill: its summit is on the doorstep of the church of San Stefano Rotundo with its unusual circular floorplan. Ideally, take a detour past the Ludus Magnus on Via Labicana where you can see the footings of The Great Gladiatorial Training School; and then make a zigzag to include the Piazza and Archbasilica of St. John Lateran – the oldest of Rome’s four basilicas. This Caeilian Hill was another fashionable residential area, and near its lower slopes are the Baths of Caracalla in which excavations have uncovered the remains of lavish villas complete with murals and mosaics. · Travelling W and then S you cross the end of the Circus Maximus and easily imagine its chariot races, before heading uphill to the top of the Aventine Hill (near the School of Dance). But go west for the treat, where your view through the orange groves gives you an aerial view of St Peters and beyond. 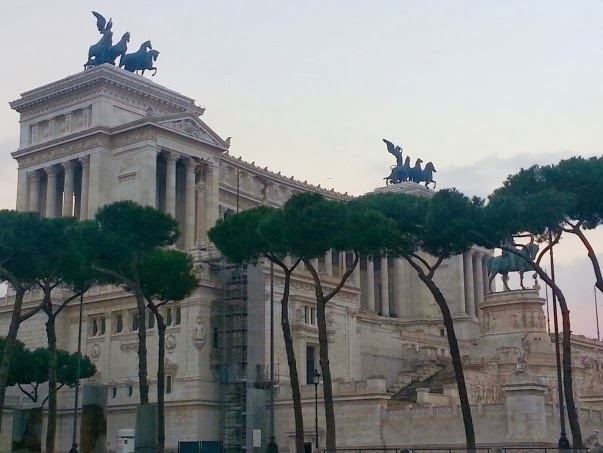 · Now you approach the Capitoline, northwards up along the curving road past the Theatre of Marcellus. Your camera battery may by now be flat, so switch to the camera in your phone! Eventually you reach the vast white marble monument to Victor Emanuel II. The northern slopes of the Hill were cleared of ancient ruins to create this edifice to honour the first king of a unified Italy. Even Italians consider it OTT and it has nicknames such as ‘typewriter’ and ‘wedding cake’. 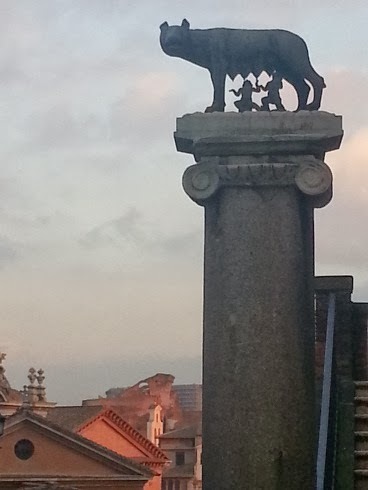 Behind this monument is the Hill proper with its square designed by Michelangelo, its statue of the equestrian Marcus Aurelius, and steps down past a column bearing Romulus, Remus and their wolf. A few paces bring you to choice spots with brilliant views over Rome’s most ancient sites. 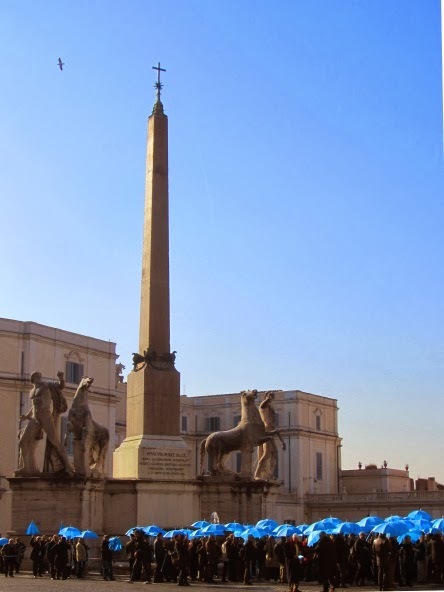 · You are now on the home run, past Trajan’s spiral column – and on to the huge obelisk in Piazza Quirinale guarded by Castor, Pollux, and their horses. Saint Peter’s is again visible due west, and as a final extension of fifty metres, walk down to the Trevi Fountain with its water still piped via aqueduct from Salone, 16 kilometres away. Such was the power of Roman civil works. And all that in an afternoon, with seven hills bagged too! According to Wikipedia the summits are located as follows; the timings are from Google Maps and would represent purposeful waking, stopping for few photos. My round took nearly 4 hours including 12 kilometres, 300 metres of ascent, lunch, and many photos.